You created all the beings and hold the world in your hands, what greatness is there in mastering the black cobra?" One day Rai Bular, the headman of Nanak Sahib's village, rode out on horseback to check his fields taking along a couple of servants. He came across Methu Kalu, who was searching for his son Guru Nanak. Looking around the pasture where Nanak’s herd usually grazed, the Rai spotted the head of a large cobra showing above the tall grass with its hood spread wide. The sweltering afternoon sunlight glittered on its scales. The cobra hovered motionless as though transfixed. He wondered what had mesmerized the serpent and why it continued to remain in the open exposing itself to the sun’s searing heat. Curious, he motioned the others to be still and urged his horse closer to investigate. Nearing the cobra, Rai Bullar saw Guru Nanak on the ground beneath it. 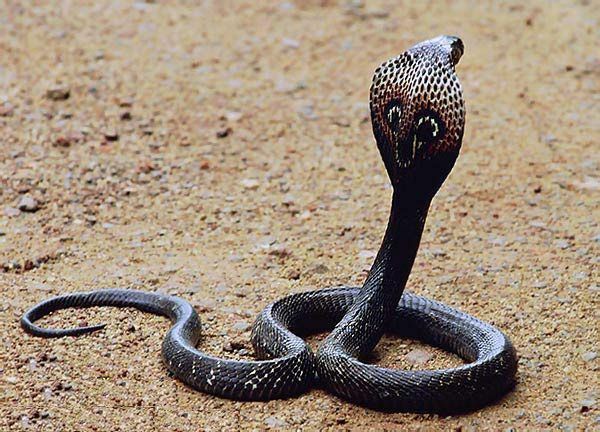 The cobra’s hood cast a dark shadow over the boys face. The approaching horse disturbed the cobra and it slithered away into the grass. 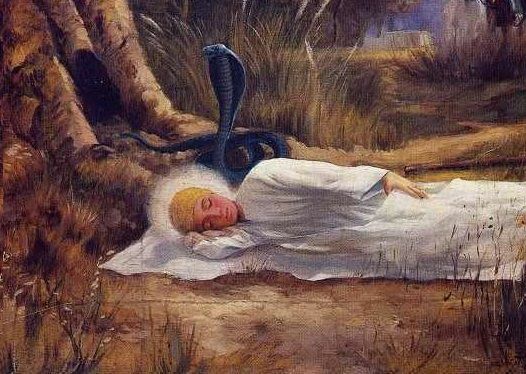 Fearing Guru Nanak had been bitten and poisoned by the serpent’s venom, Rai Bullar jumped from his horse and bent over the boy’s body. Deeply absorbed in a meditative state and unaware of his surroundings, Guru Nanak appeared senseless. Rai Bular roused Guru Nanak and found him unharmed. Guru Nanak had become so deeply entranced, while contemplating God as his herd grazed, that he had neglected to move out of the sun. Rai Bular realized that the cobra had been offering protection by sheltering the boy from the sun’s scorching rays. Methu Kalu approached Guru Nanak and was concerned for his welfare of his only son. Astounded, the servants felt that the incident had shown Guru Nanak to be a saint. Rai Bular commented to Mehta Kalu that his son had a divine spirit and told him the boy must surely be destined to be something other than a mere grazer. The Janam Sakhis mention how Sri Guru Nanak Sahib Ji was one day sleeping on the ground under a Mal tree here.